No to US-Led Attempts at "Regime Change"! 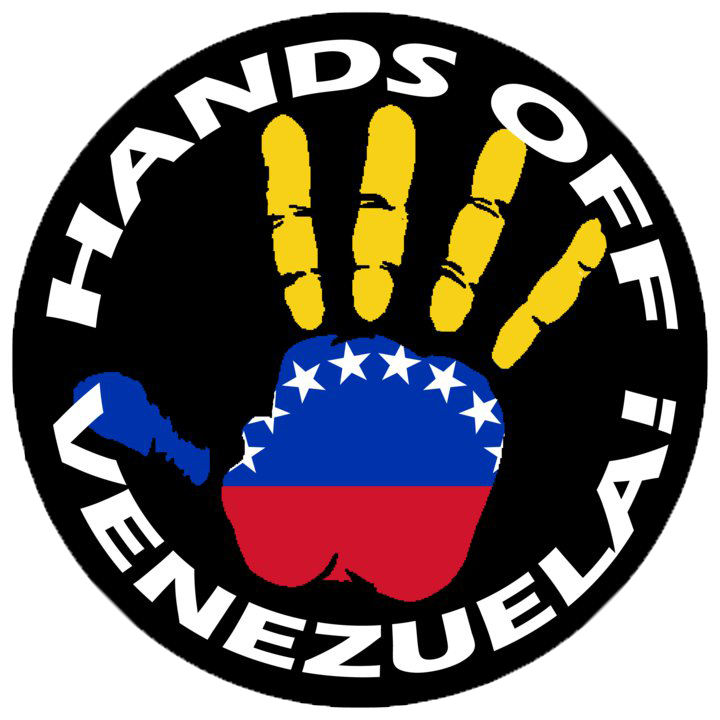 Hands Off Venezuela! No to US-Led Attempts at "Regime Change"! Maduro Is Venezuela's President! No to US-Led Attempts at "Regime Change"! Maduro Is Venezuela's President! 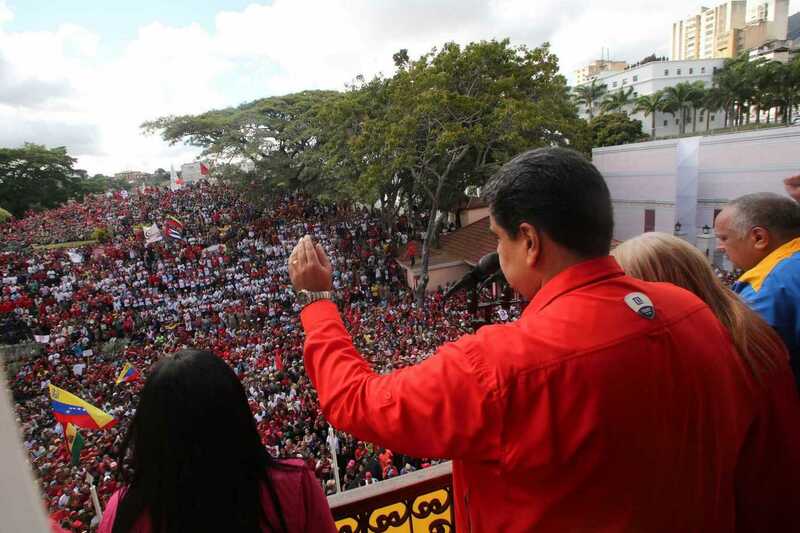 President Maduro addresses thousands of Venezuelans rallying at Miraflores Palance and elsewehre in Caracas to affirm their loyalty to his presidency and the Bolivarian Revolution, January 23, 2019. 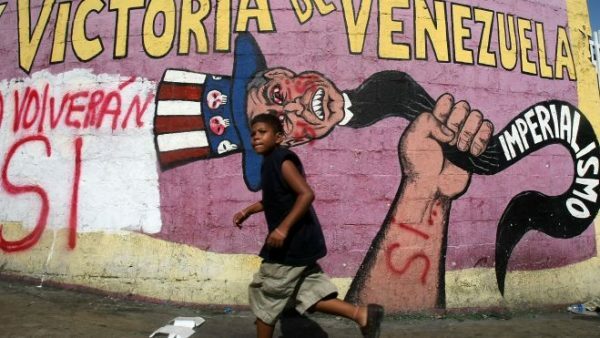 US imperialism and the coup forces following its leadership have been stepping up their attempts to force regime change on the people of Venezuela. After hastily recognising the illegal and unconstitutional declaration of Juan Guaidó that he is the "legitimate" president of Venezuela, President Trump and his cohorts were threatening the full weight of the power of the United States to impose regime change. This they label as "the restoration of Venezuelan democracy". But just because this is so brazenly unhinged does not mean that the threat is not serious. Trump's National Security Advisor, John Bolton, who wrote on his notepad: "5,000 troops to Colombia," told Fox News: "We are in conversations with major oil companies to produce Venezuelan oil, which is good for Venezuela and good for the US." The barrage of propaganda, attempting to create the conditions for "regime change", or provide it with a flimsy fig-leaf, flies in the face of the concrete situation in Venezuela and its Bolivarian revolution. President Nicolas Maduro is the legitimate president of Venezuela, the presidential elections assessed as some of the fairest in the entire world by independent observers. The crisis which Venezuela has been facing has been due in no small part to the interference of the US and its imposition of sanctions, as part of imperialism attempting to stem the tide of progress and democracy in Venezuela and other South American countries. Nor was the British government slow to join the US imperialist band wagon, and itself recognise Guaidó as "interim president". And although the European Parliament voted to recognise Guaidó, a proposed EU statement doing so was vetoed by Italy. This follows similar defeats at the Organisation of American States (OAS) and the United Nations. The Foreign Secretary's statements have been particularly repugnant. Jeremy Hunt told Juan Guaidó that "there are many people in the UK who admire his courage and support what he is doing under the Venezuelan constitution". Hunt joined the US and its cohorts in issuing a so-called ultimatum that unless Nicolas Maduro called elections within eight days, Britain would recognise Guaidó as interim President of Venezuela, saying that Maduro "has ignored this call". Hunt continued: "The people of Venezuela have suffered enough. It is time for a new start, with free and fair elections in accordance with international democratic standards. The oppression of the illegitimate, kleptocratic Maduro regime must end. Those who continue to violate the human rights of ordinary Venezuelans under an illegitimate regime will be called to account. The Venezuelan people deserve a better future." 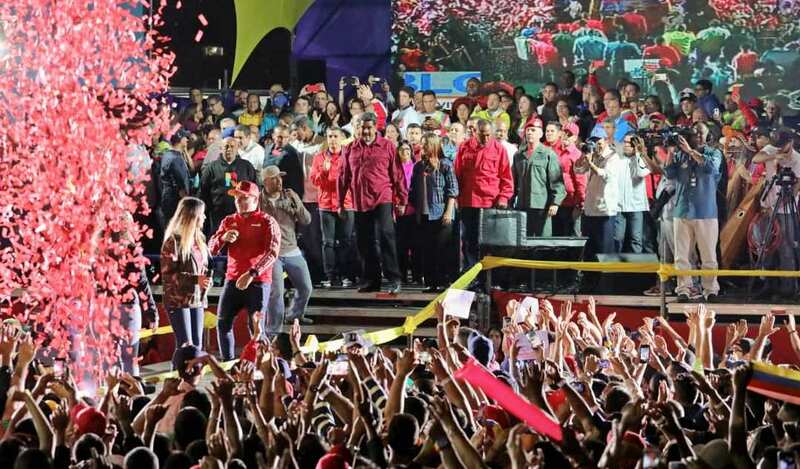 People celebrate with their President Nicolas Maduro on Venezuela's achievement of 2.4 million homes built for working-class Venezuelans as part of the government's Great Housing Mission, December 2018. 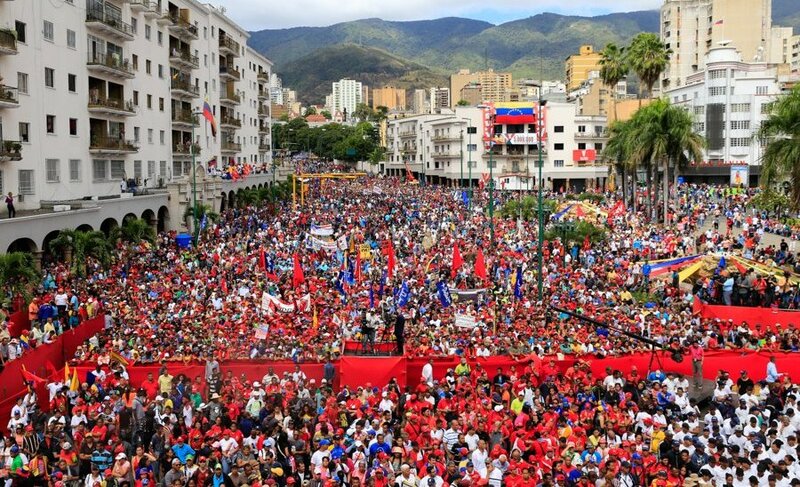 Meanwhile, the streets of Caracas have been filled with tens of thousands of people who are determined to reject the coup attempt against their president, Nicolas Maduro. They uphold the Bolivarian revolution that is the legacy of Hugo Chávez. President Maduro declared: "I agree that the legislative power of the country be re-legitimized and that we hold free elections with guarantees, and the people choose a new National Assembly." Maduro denounced the U.S.-led coup attempt and called on his supporters to organise their own march in defence of the Bolivarian Revolution. Of the US President Donald Trump's administration, which had recently imposed sanctions on Venezuelan oil exports, he asked: "Do you think you are the emperor of the world? Do you think Venezuela is going to give up and obey your orders? We will not surrender." President Maduro announced the decision of the Bolivarian government to sever all ties with the US government, giving its diplomatic personnel 72 hours to leave the country. Despite what the US, Britain and others declare, the imperialist system of states does not represent "the international community". In so declaring, they are hanging on to the arrogant conception of the "English-speaking peoples" so beloved of post-World War II champions of reaction such as Churchill, that there is a manifest destiny to decide what goes on in the world and dictate and control the course of events and world history. The repugnant debates in the House of Commons have epitomised this mindset. There have been two debates, on January 28 and February 7. The government repeated all the lies and disinformation about the presidential election being "deeply flawed", and that the crisis is due to the "kleptocratic regime of Nicolas Maduro". The tenor of the debate, as is customary when discussing affairs of Africa, Latin America and other parts of the world, is that Britain has the right to decide. It is not even Eurocentric, as can be seen with the contempt certain sections hold the European Union. And the debates were peppered with references to "the international community", when the fact is that the US could not get a resolution recognizing its puppet Guaidó passed at either the Organisation of American States or the UN Security Council because the majority refused to go along with violating Venezuela's sovereignty and right to self-determination. It is not even acknowledged that Russia, China, Turkey, South Africa, India, Iran, Syria, and other UN member states have refused to go along with the US replacing Venezuela's president with a puppet of its own, with many expressing full support for Nicolas Maduro as the duly elected president. No importance is given either to the expression of solidarity with the Venezuelan people and President Maduro by a ranking authority of the 55-member African Union, or the fact that many countries from different parts of Asia have not weighed in thus far. It should be noted also that practically all the Labour MPs who spoke in the debates, including the Shadow Foreign Secretary, were egging on the government to condemn Maduro and recognise Guaidó. This was in stark contrast to the stand of the Leader of the Opposition, causing the Minister of State, Alan Duncan, to comment, "May I, at the very least, welcome the right hon. Lady's condemnation of the Maduro regime? In that, at least, we find common ground, which I hope can be shared across the House. I am only sorry that it is not even shared across her own Front Benchers, as it is quite clear that the sympathies of the shadow Chancellor are at odds with the tone of her contribution to these proceedings." Another Conservative MP described Jeremy Corbyn as a "Poundland Lenin". This demonstrates how entrenched is the mindset of a pro-war government throughout the proceedings of Parliament. The fact that Jeremy Corbyn, who took anti-war stands as one of a small group of "left-wing" MPs against the Blairite consensus of New Labour, is now leader has not put an end to such a pro-war outlook and support for armed intervention abroad. It underlines once again the need for an anti-war government and that new forms must be brought into being. For the record, Jeremy Corbyn characterised his stand as follows: "The future of Venezuela is a matter for Venezuelans. Jeremy Hunt's call for more sanctions on Venezuela is wrong. We oppose outside interference in Venezuela, whether from the US or anywhere else. There needs to be dialogue and a negotiated settlement to overcome the crisis." Speculation is now being ramped up about the prospect of a US military intervention in Venezuela, and preparations for just that are being put in place with talk of the military option being "on the table". The British government is still cloaking this in terms of opening up corridors for humanitarian assistance. For instance, Alan Duncan spoke of "the inevitable need for rapid delivery of resources can suddenly become apparent, and it is important that the world is ready to leap straight away into action". Actions are however being taken to demand that no military intervention take place, that the Venezuelan people be allowed to determine their own future without outside interference, and to stand with the Venezuelan people in affirming that Nicolas Maduro is the legitimate President of Venezuela. Stand with the Venezuelan People and their President! It was also reported that several weeks ago the Bank of England blocked the Venezuela government from repatriating 31 tonnes of gold reserves worth $1.2 billion held in London. That extraordinary refusal by the British authorities had to have been a deliberate political decision, and was way before the tumultuous events in Venezuela last week, suggesting those events were not simply spontaneous. Alan Duncan, Minister of State at the Foreign Office, said: "On gold, there are gold reserves held by the Bank of England. It holds them under a contract; it is entirely down to the Bank, as an independent Bank of England. It is nothing to do with this Government. We are not empowered to, nor should we in any way attempt to, influence the decision of the Bank of England. I am sure that the Bank will be looking at unfolding events in Venezuela to work out who is legitimate and who is not." This, again, is disingenuous. The holding of the Venezuelan gold by the Bank of England is illegitimate and amounts to theft of Venezuelan assets. 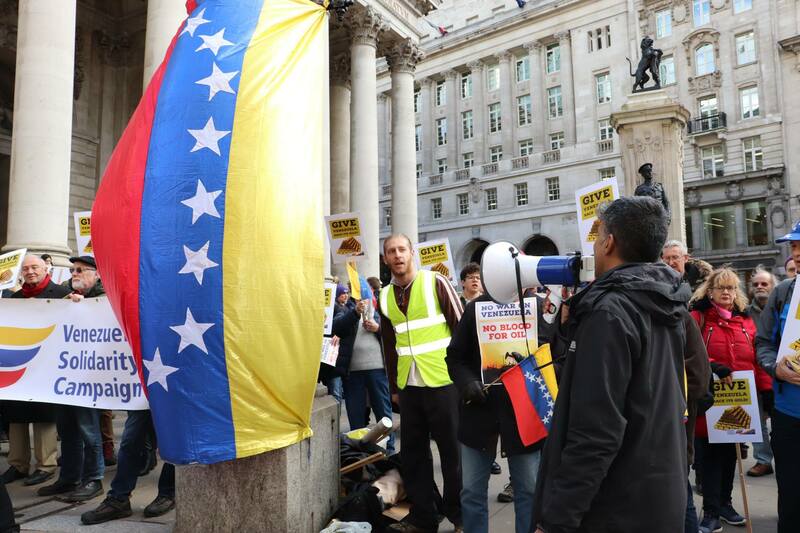 A militant picket was organised by the Venezuela Solidarity Campaign outside the Bank of England on February 7 to demand: Give Venezuela back its gold! 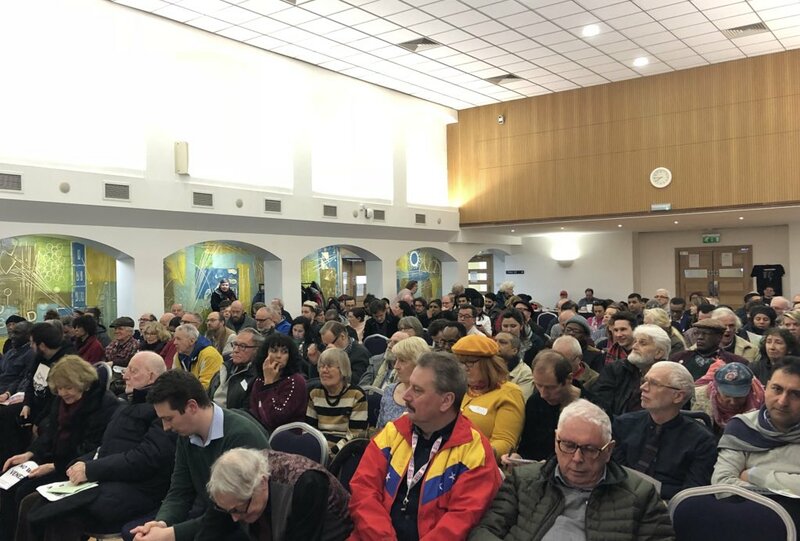 Over a hundred people packed out a rally in London at short notice to oppose Trump's hostile push for regime change in Venezuela and the British government's role in demanding intervention. The rally on January 31 was organised by the Venezuela Solidarity Campaign in a huge show of solidarity with the people of Venezuela. It was one of a number of rallies and public meetings defending Venezuela happening around the country. Britain has joined Trump, Bolsonaro, Trudeau and European heads of state to call for regime change in Venezuela. The European Parliament called on EU countries to recognise the self-declared "Interim President" Juan Guaidó as the legitimate leader of Venezuela, and Theresa May joined Macron and Merkel to tell Maduro he had to call a general election in eight days or they'd recognise Guaidó as President. The irony that Theresa May, the Prime Minister without a majority, who just faced the biggest historic defeat in Parliament on her party's flagship policy, and who refuses to call a general election despite there being no majority in Parliament for her Brexit deal or any alternative, but is calling for an election in Venezuela, was not lost on anyone. Neither was the fact that Macron is currently France's most unpopular President with the most favourable polls giving him an approval rating of 27%, while his country has been wrought with three months of consecutive weekly protests of tens and hundreds of thousands of people and is gearing up for a general strike next week. That May and Macron think they can give ultimatums to leaders of other countries shows just how farcical this is. Tariq Ali pointed out that Venezuela has not had the opportunity to navigate out of the crisis thanks to the crippling US sanctions and the deliberate destabilisation of the country through years of systematically corrupting state institutions from the outside. Other speakers talked about Juan Guaidó's training in the US, his involvement in groups funded by the US government, and participation in inciting brutal street violence that killed civilians in Caracas. Huda Elmi pointed out that the apparent saviours of democracy in Venezuela are Trump and his special envoy to Venezuela, Elliott Abrams, whose credentials include covering up a US Army massacre in El Salvador and being convicted for his role in the Nicaragua Contras scandal. It's clear that Trump and his allies have no regard for democracy or the well-being of Venezuelans. The push for regime change in Venezuela is part of a co-ordinated attempt to roll back the progressive gains of the Bolivarian revolution and "pink tide" and usher in right wing neo-liberal governments across the region in the US's "backyard". Indeed, John Bolton has already said in clear terms that one of their goals is to privatise Venezuela's oil and put it under the control of US companies; and Juan Guaidó has indicated he would welcome US military intervention. 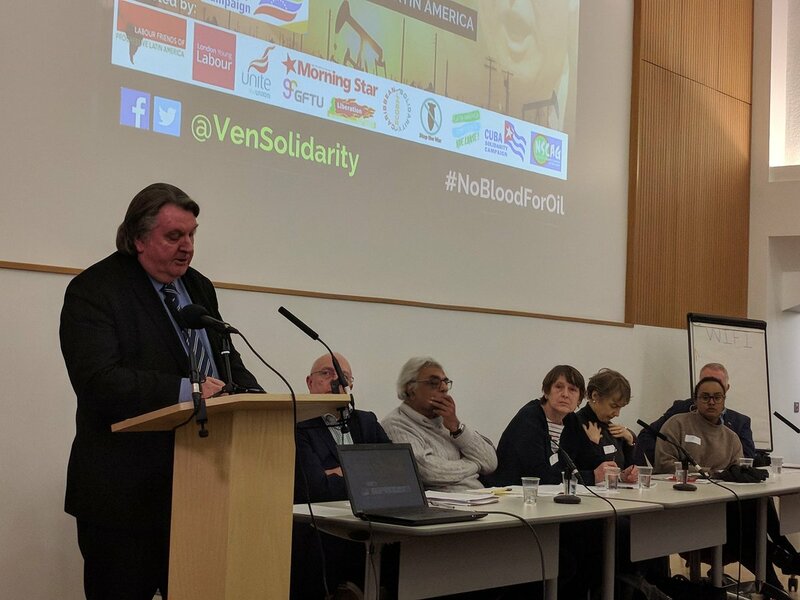 The rally was an impressive show of solidarity with Venezuela, and a reminder that the British labour movement which was instrumental in the international campaign against the coup in Chile and apartheid in South Africa, is prepared to defend Venezuela. There will be many more rallies and protests in the days and weeks to follow to ramp up the pressure against Theresa May's support for Trump's imperialist attack on Venezuela. I am Tony Burke, Chair of the Venezuela Solidarity Campaign who called today's event and I am also speaking on behalf of Unite the Union and Worker's Uniting, our Global Union. Workers Uniting is the global union - representing more than two million workers in Canada, Ireland, Mexico, the United Kingdom and the United States - formed by UNITE, the United Steelworkers of the US and Canada and the Mexican metals and mining union (Los Mineros), and I bring you the support of Len McCluskey of Unite, Leo Gerard of the United Steelworkers and Napoleon Gomez of Los Minero's in Mexico. Our statement issued last week is clear in "condemning the US-led recognition of an unelected opposition leader, Juan Guaidó, as president of Venezuela". It "also condemns the actions of the governments of the UK, Canada and other countries that have slavishly followed the US lead". It also argues: "Over the past 20 years the US has endeavoured to destabilise Venezuela with economic warfare and a financial blockade in their attempt to assert its influence and control over the oil, gold and mineral-rich country. These actions, which clearly violate international law, now culminate in the recognition of an unelected opposition leader as president of the country - effectively a right wing coup attempt." It also states: "Workers Uniting strongly condemns the US threat of military action and its attempt to add Venezuela to the list of state sponsors of terrorism in order to justify such action." Let's be clear. Such US-led "regime changes" have been a disaster in other countries in recent years and there's no reason to believe it would help the people of Venezuela. This is not about democracy or human rights - its about gaining control of the world's largest proven oil and petroleum reserves. Polling suggests the majority of Venezuelans - both pro and anti government - are against tighter US sanctions, which damage the private sector and living standards of ordinary Venezuelans, including the poorest. Extending these further will only make things worse. In light of this it's important to keep up our solidarity and be clear that whatever problems countries like Venezuela face, neo-liberalism and US intervention is not the answer. Finally, I'd like to offer some hope in our discussions on Latin America and that is the victory of the left in Mexico, which has led to that government having a pro-dialogue position in Venezuela. We stand with the Left and Unions across Latin America, from celebrating victory in Mexico to fighting fascism in Brazil, to working together against illegal "regime change" and for dialogue in Venezuela. Let's not let there be any more Pinochet's in Latin America - and stand clearly with social progress, and self-determination, against Trump's intervention. After his mission, he continued to follow developments in the Bolivarian Republic of Venezuela, including the refusal of the opposition to sign the negotiated agreement of 7 February 2018, the Declaration of the Summit of the Americas and that of the People's Summit, both held in Lima in April 2018. He recognises that the Bolivarian Republic of Venezuela and Ecuador both devote around 70 per cent of their national budgets to social services. A priority for both countries is to promote dialogue among all sectors of the population. The genuine thirst for peace and justice, which the Ecuadoreans call buen vivir, is reflected in the 2013 Quito Communiqué adopted by the Inter-Parliamentary Union and in the 2014 CELAC declaration proclaiming Latin America and the Caribbean a "zone of peace". A problem in assessing the situation is the widening gulf between the Government's and the opposition's narratives, and the media disinformation, simplification and extrapolation. The Independent Expert consulted data from multiple sources, including presentations by non-governmental organizations (NGOs) to the Human Rights Council. Undoubtedly, Venezuelans are suffering from an economic crisis that has generated dysfunctions, scarcity in foods and medicines, delays in distribution, and accompanying violations of human rights. Critics in and outside the country see it as a failed State and blame the crisis on the fiasco of socialism, but few look for other contributing factors. By contrast, the Government tends to blame outside causes, notably the drop in oil prices, international smuggling rings, contraband, sanctions, and 19 years of economic warfare, not unlike the non-conventional wars waged against Cuba, Chile and Nicaragua. With political will and international solidarity, solutions can be found, since the Bolivarian Republic of Venezuela is a rich country with the largest oil reserves in the world and major gold, bauxite and coltan deposits, enough to finance the needs of the Venezuelan people, provided that the country is allowed to function free of embargoes and financial blockades. The Independent Expert inquired from the Government and the opposition about the impact of measures adopted by several States aimed directly and indirectly at affecting the functioning of the Venezuelan economy. He also looked at the problem of currency speculation, one of the preferred tools to destabilise targeted economies, and the activities of credit rating agencies, which, although they have neither democratic legitimacy nor oversight, have a significant impact on the financial ability of States to issue bonds and obtain financing. The Banco Central de Venezuela informed him that risk rating agencies, primarily Standard & Poor's, Moody's and Fitch, have consistently issued negative ratings based on the country's ability to make external payments, forgetting that the Government has a history of excellent debt response. That has had a significant effect on the country's risk level and has essentially shut down its possibilities of accessing the financial market. The principles of non-intervention and non-interference in the internal affairs of sovereign States belong to customary international law and have been reaffirmed in General Assembly resolutions, notably 2625 (XXV) and 3314 (XXIX), and in the 1993 Vienna Declaration and Programme of Action. Article 32 of the Charter of Economic Rights and Duties of States, adopted by the General Assembly in 1974, stipulates that no State may use or encourage the use of economic, political or any other type of measures to coerce another State in order to obtain from it the subordination of the exercise of its sovereign rights. While he was in the Bolivarian Republic of Venezuela, the Independent Expert had long conversations and email exchanges with Pasqualina Curcio, who published a well-documented book entitled The visible hand of the market, analysing the economic war. She reminds readers that in 1970, when Salvador Allende was democratically elected President of Chile, Richard Nixon told Henry Kissinger that the United States would not tolerate an alternative economic model in Latin America and gave orders to "make the Chilean economy scream", and when all the boycotts and sanctions failed, Allende was removed by Pinochet's coup in September 1973. The Spanish economist Alfredo Serrano, head of the Centro Estratégico Latinoamericano de Geopolítica, analyses the manipulation of the "country risk factor", the refusal of banks to process Venezuelan international transactions, the obstacles to obtaining insulin and other medicines, the artificially induced inflation, and the arbitrary "dollar today" figures. Furthermore, staff of the Banco Central de Venezuela explained to the Independent Expert that the pernicious exchange rate published on a website that was not grounded in factual purchase and sale transactions had been negatively impacting the economy, primarily, as a price marker, raising inflations levels, constituting an instrument of war that had risen constantly, accumulating during the year an upward variation trend over 2,465 per cent. The effects of sanctions imposed by Presidents Obama and Trump and unilateral measures by Canada and the European Union have directly and indirectly aggravated the shortages in medicines such as insulin and anti-retroviral drugs. To the extent that economic sanctions have caused delays in distribution and thus contributed to many deaths, sanctions contravene the human rights obligations of the countries imposing them. Moreover, sanctions can amount to crimes against humanity under Article 7 of the Rome Statute of the International Criminal Court. An investigation by that Court would be appropriate, but the geopolitical submissiveness of the Court may prevent this. Modern-day economic sanctions and blockades are comparable with medieval sieges of towns with the intention of forcing them to surrender. Twenty-first century sanctions attempt to bring not just a town, but sovereign countries to their knees. A difference, perhaps, is that twenty-first century sanctions are accompanied by the manipulation of public opinion through "fake news", aggressive public relations and a pseudo-human rights rhetoric so as to give the impression that a human rights "end" justifies the criminal means. There is not only a horizontal juridical world order governed by the Charter of the United Nations and principles of sovereign equality, but also a vertical world order reflecting the hierarchy of a geopolitical system that links dominant States with the rest of the world according to military and economic power. It is the latter, geopolitical system that generates geopolitical crimes, hitherto in total impunity. It is reported that the United States is currently training foreign lawyers in how to draft legislation to impose further sanctions on the Bolivarian Republic of Venezuela in an effort to asphyxiate Venezuelan State institutions. Today, millions of Venezuelans worry that foreign interests may again finance a coup to impose a neo-liberal government that would abolish public services and destroy the social acquis. This could engender civil war, since a significant percentage of the population still identifies with the ideals of Chavismo. In an interview with The New York Times, opposition leader Leopoldo López expressed views endorsing interventionism: "In 1958, there was a military coup that began the transition to democracy .... And in other Latin American countries, there have been coups that called elections. So I don't want to rule anything out, because the electoral window has been closed. We need to go forward on many different levels. One is street demonstrations; a second is coordination with the international community." Those who shout "humanitarian crisis" should inquire whether the economic war and the sanctions are not a major cause. The principle of estoppel prevents those contributing to the crisis from invoking it to demand intervention (ex injuria non oritur jus). A disquieting media campaign seeks to force observers into a preconceived view that there is a "humanitarian crisis" in the Bolivarian Republic of Venezuela. An independent expert must be wary of hyperbole, bearing in mind that "humanitarian crisis" is a terminus technicus that can be misused as a pretext for military intervention. It is pertinent to recall the situation in the years prior to the election of Hugo Chávez, when the International Monetary Fund (IMF) imposed on Venezuela the "Washington consensus" of restructuring programmes, austerity and privatisation (see A/72/1787), which led to mass public demonstrations and a military crackdown, the Caracazo of 1989, leaving some 3,000 dead. Corruption was ubiquitous and in 1993, President Carlos Pérez was removed because of embezzlement. The Chávez election in 1998 reflected despair with the corruption and neo-liberal policies of the 1980s and 1990s, and rejection of the gulf between the super-rich and the abject poor. Participatory democracy in the Bolivarian Republic of Venezuela, called protagónica, is anchored in the Constitution of 1999 and relies on frequent elections and referendums. During the mission, the Independent Expert exchanged views with the Electoral Commission and learned that in the 19 years since Chávez, 25 elections and referendums had been conducted, 4 of them observed by the Carter Centre. The Independent Expert met with the representative of the Carter Centre in the Bolivarian Republic of Venezuela, who recalled Carter 's positive assessment of the electoral system. They also discussed the constitutional objections raised by the opposition to the referendum held on 30 July 2017, resulting in the creation of a Constitutional Assembly. Over 8 million Venezuelans voted in the referendum, which was accompanied by international observers, including from the Council of Electoral Specialists of Latin America. [...] As demonstrated in 13 thematic reports, other players impact on the enjoyment of human rights, including the World Trade Organisation, the World Bank, the International Monetary Fund, transnational corporations and some lobbies like the military-industrial-financial complex. These actors often wield more influence than States. Moreover, the national and international economic orders are distorted by bilateral investment treaties, free trade agreements, credit rating agencies, vulture funds, boycotts and unilateral coercive measures, which have often resulted in the suffering of billions of individuals. Rapporteurs should focus not only on States and their failures, but also on other actors and the pervasive lack of accountability. We urge the United States and Canadian governments to immediately remove their illegal sanctions against Venezuela and to support efforts at mediation between the government of Venezuela and the non violent segments of the political opposition. We, the undersigned organisations and individuals in the US and Canada, support hemispheric relations based on respect for the sovereignty of all peoples of the Americas. We are deeply concerned by the use of illegal sanctions, whose effect falls most heavily on the poorest and most marginal sectors of society, to coerce political and economic change in a sister democracy. Polls in Venezuela show that the large majority of Venezuelans oppose sanctions, regardless of their opinion of the Maduro government. Sanctions merely complicate efforts by the Vatican, Dominican Republic, and other international actors to mediate a resolution to the deep polarisation in Venezuela. Moreover, sanctions undermine efforts of the democratically elected government and Constituent Assembly to address critical economic issues and determine their own political destiny. Despite the high-minded rhetoric of officials in Washington and Ottawa, it is not a genuine concern for democracy, human rights, and social justice that drives the belligerent interventionist posture towards Caracas. From former US president Obama's admittedly untrue presidential decree that Venezuela represents a national security threat to the United States, to UN Ambassador Nikki Haley's declaration that Venezuela is "an increasingly violent narco-state" that threatens the world, the use of hyperbole in diplomatic situations seldom contributes to peaceful solutions on the world stage. 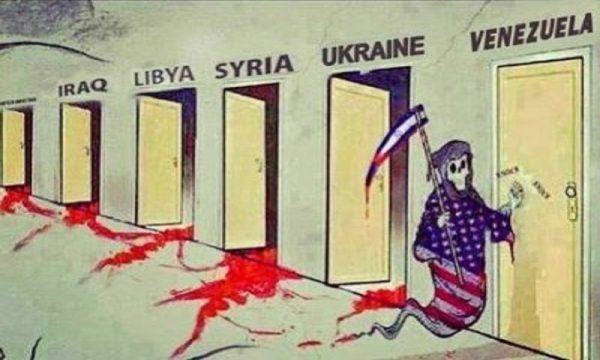 It is no secret that Venezuela, unlike Mexico, Honduras, Colombia, Egypt, or Saudi Arabia, is targeted for regime change by the US precisely because of Venezuela's leadership in resisting US hegemony and the imposition of the neo-liberal model in Latin America. And of course, Venezuela holds the largest oil reserves in the world, attracting more unwanted attention from Washington. The US and Canada tried and failed to use the Organisation of American States (OAS) to build a bloc to hypocritically evoke the Democratic Charter against Venezuela. Recently, Luis Almagro, the rogue Secretary General of the OAS, went so far as to publicly support the swearing in of a parallel Supreme Court unconstitutionally appointed by opposition legislators and allowed them to use the OAS headquarters in Washington, DC for their ceremony - without the approval of any OAS member state. Almagro has thereby delegitimised the OAS, emboldened the most extreme and violent elements of the Venezuelan opposition, and side-lined efforts at mediation. The US-Canadian sanctions represent a cynical use of coercive economic power to attack a nation that is already dealing with hyperinflation and shortages of basic commodities. While said to be in the name of advancing democracy and freedom, the sanctions violate the Venezuelan peoples' basic human right to sovereignty, as outlined in the UN and OAS Charters. We call on the political leaders of the United States and Canada to reject overheated rhetoric and to contribute to the search for real solutions to Venezuela's political and economic problems. We urge the US and Canadian governments to rescind their sanctions and support the mediation efforts pursued by the Chancellor of the Dominican Republic Miguel Vargas, the President of Dominican Republic Danilo Medina, former Spanish Prime Minister José Luis Rodríguez Zapatero, the Vatican, and supported by a growing number of Latin American nations. The US is leading an economic war against Venezuela that is causing tremendous damage. This chronicle by a member of Venezuelanalysis' Delegation reports on the electoral process and the economic situation in the Caribbean nation. In reality, Venezuela had free, fair and transparent elections and manages the most sophisticated and accurate voting system in the world. Former President Jimmy Carter, whose Carter Centre has a Democracy Programme, said, "As a matter of fact, of the 92 elections that we've monitored, I would say that the election process in Venezuela is the best in the world." This is consistent with others who have monitored Venezuelan elections. In the recent election, there were 150 international observers from over 30 countries who also noted the advanced nature of the election system and validated the results. 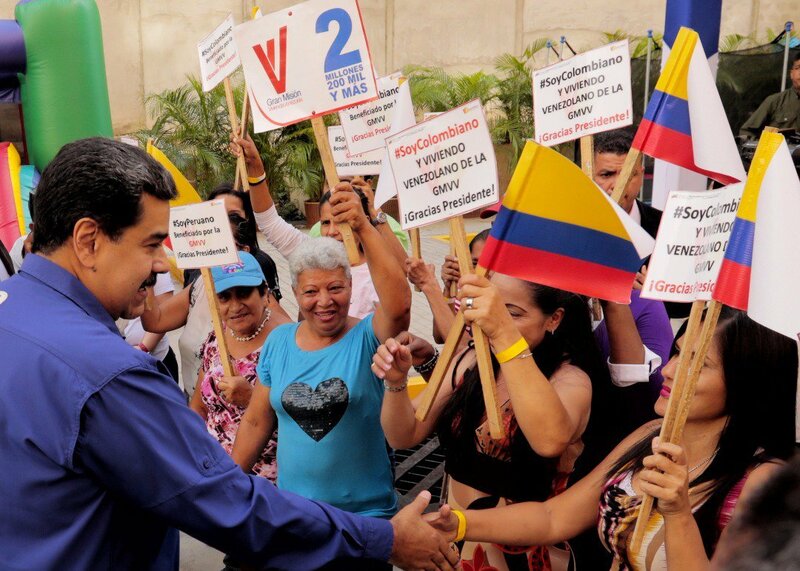 The opposition and the United States faced two choices in this election: (1) run against President Maduro and the Bolivarian Revolution, or (2) seek to undermine the election by not participating. The US decided the latter approach was the best alternative and directed its vassals in Venezuela to boycott. Henri Falcon, the leading opposition candidate, did poorly, falsely declaring the election a fraud. 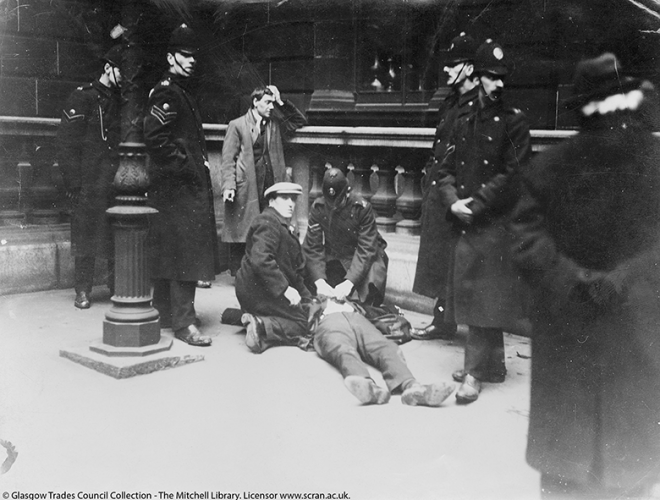 Not only did the boycott hurt him, but he also advocated succumbing to the United States, e.g. dollarize the economy and seek loans from the IMF and western financiers. This was not popular because such loans end up being a disaster for national sovereignty as the financiers dictate neo-liberal policies that send money to the capitalists while cutting essential services for the people. The Venezuelan people are well aware of who is causing their problems. When we took a tour of the Metro Cable, a Chavez-built gondola that brings people in poor neighbourhoods down the hillside, we were stopped by a grandmother who had a message she wanted us to share with people in the United States. She said, "We know you want our oil, but stop punishing the people of Venezuela." When the Bolivarian Revolution had money from high oil prices, it was used to improve the lives of the poor. The results were marked decreases in poverty and illiteracy and increased access to health care and housing. The economic war has put stress on all of these programmes, but Maduro persists despite it. One of the great successes of the Maduro era is the Housing Mission, which built two million homes for the poor. Each home houses four to five people, meaning eight to ten million people received housing, which included furniture. This is quite an accomplishment in a nation of 32 million people. The programme began in 2011 after there were devastating mudslides and hopes to reach 3 million homes by 2019. Compare this to the United States, which is in a housing crisis, where the 2,461 people are evicted every day, and poor and middle-class families are housing-insecure. Consider the US response to the storms in Puerto Rico, where nine months later the island is still in crisis, or cities like my home town of Baltimore, where we have thousands of homeless and 16,000 abandoned homes. Maduro has also fought off agribusiness by banning GMO's and the privatising of seeds, protecting indigenous food knowledge from corporate capture and seeking to create a democratic food system. Venezuela is an example of ecosocialism, where food systems are socialised and developed in an economically sensible and sustainable way. These are just some of the social programmes that Venezuela has sought to expand under Maduro. Maduro has also tried to break the financial blockade with oil-backed cryptocurrency. The National Constituent Assembly is pointed to as an example of dictatorship. When the opposition won a large majority, they showed their true colours by removing portraits of Hugo Chávez and Simon Bolivar. Then they passed an amnesty law for themselves where they listed all 17 years of crimes in seeking to overthrow the government. This law was found unconstitutional by the court. The opposition promised removal of Maduro within six months and incarceration of Chavista leaders when they took power. 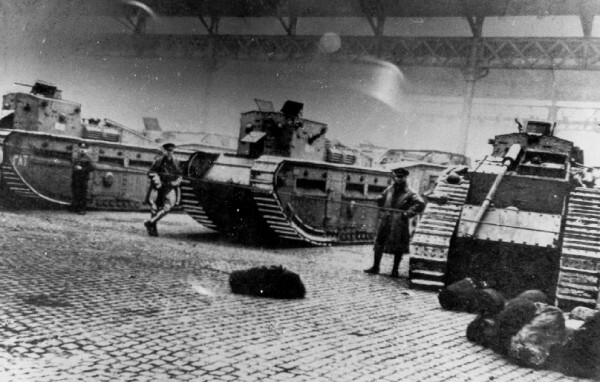 Violent opposition protests followed that led to over 125 deaths. The Supreme Court found that three of the right wing legislators were elected by fraud and until they left, the Assembly could not act. The Assembly refused the court's decision and in the midst of a stalemate, Maduro used his constitutional power to activate the National Constituent Assembly. The opposition tried to block the vote and 200 polling stations were besieged on election day, but it went forward. Chavistas were elected but the opposition claimed the turnout of over eight million voters was "too high" to be credible. These councils are the frontline of participatory democracy, but are ignored by the western media, as they are inconsistent with the claims of "dictatorship". For the Bolivarian Revolution, the councils are intended to ultimately replace the democratic liberal state by bringing together citizens, social movements, and community organisations, to practice direct participatory self-governance. They are a main pillar in the transition to an ecosocialist, communal state. They are a work in progress, striving toward these goals based on a belief in the sovereignty of the people, which take on more functions of the public sector as they demonstrate competence. Maduro recognises Venezuela is still a capitalist-based economy and has identified the commune as the centrepiece of democratic socialist governance. The example of creating real democracy, working to break from capitalism and moving to a socialised economy by and for the people, is what the United States and oligarchs fear. That is why Maduro is called a dictator and the US calls for a military coup "to restore democracy", which really means restore the pre-1998 oligarchy and protect capitalism. While Maduro won the election against Venezuelan candidates, he was really running against US imperialism. Maduro overcame great challenges to win a mandate to continue the Bolivarian Revolution. After the election, he urged dialogue with the opposition, seeking to move Venezuela to peace. Maduro also ordered the US Charge d'Affaires Todd Robinson and head of political affairs (who he described as the head of the CIA), Brian Naranjo, to leave Venezuela. He accused them of being involved in "a military conspiracy" against Venezuela. This is consistent with calls for a military coup by former Secretary of State Tillerson and Senator Rubio as well as Trump's claims of a military option for Venezuela. Maduro must confront the economic war and build an independent economy, alongside and often led by the communes. Grass-roots activists are calling for a National Emergency Plan on food, the electric system and Internet, health care and education. China and Russia recognised Maduro's victory. He needs their support for major projects. Various monopolies, particularly in the car industry, have recently shown that they are willing to shift their political stances, whenever it suits, in their efforts to gain markets and compete. Nissan is the latest. 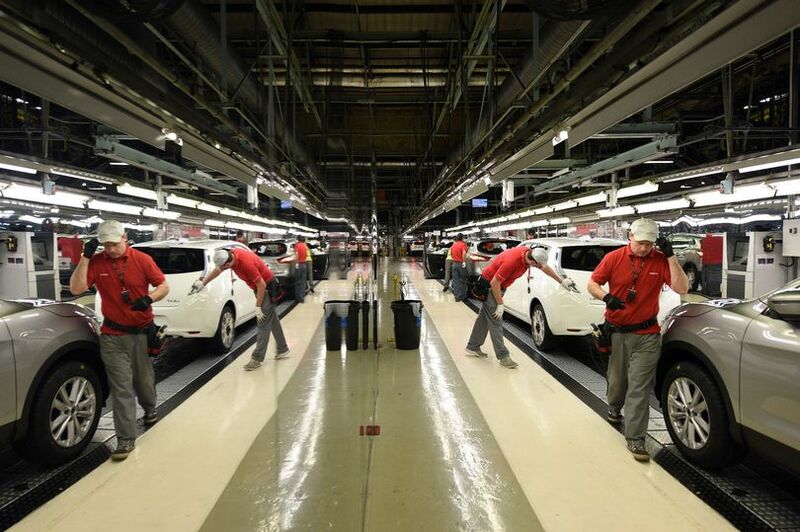 Several carmakers, including Jaguar Land Rover, Toyota and Vauxhall have talked of disruption to their supply chains in the event of a no-deal Brexit and have acted in their own ways. Nissan is willing to carry out its plan to solely build the X-Trail SUV in Japan, despite receiving huge government and taxpayers' handouts to support investment. The company has blatantly torn up agreements with the government. Consequently, it will have to reapply for nearly £60m of support after reneging on an agreement to build its X-Trail SUV in Washington, Sunderland. Nissan had originally asked for £80m, reduced to £61m after a review by an independent advisory committee. Not only has the company gained enormously since the 1980s, when the plant was built, to the present, from the cumulative amount of value it has claimed from the labour it has exploited, but it also has demanded free funding from the rest of the working class who pay tax. Companies are using their property rights in this country, which trump public right, to export capital or invest in plant and labour wherever they want. The excuse by Nissan was that it was a "commercial decision", pointing to the lack of market in Europe for diesel cars, an excuse backed by various political representatives in parliament. It shows that the decision-making process is not only influenced, but controlled, by monopoly capital. It exposes the farce of government of the people and for the people, where working people either have no say over the direction the economy is taking, or on "Brexit", where the contradictions and chaos caused by the factions in parliament are seeking to further drag the people into the political arena to help sort out their economic and political crises. A letter from the government to Nissan, written in 2016, states that the Japanese carmaker would only get the money if it made the car in the Britain. So far Nissan has received £2.6m, which it is now liable to pay back. Already the company is squabbling over receipt of the rest, which it deems is their right, and holds the sword of Damocles over the workers' heads regarding the rest of its investments. Business Secretary, Greg Clark, said the X-Trail would have created 741 UK jobs. Qashqai, Juke and Leaf models are also produced in Sunderland, where the company employs 7,000 workers. Nissan is part-owned by France's Renault and could move production to France in future to avoid any post-Brexit EU tariffs. In what amounts to blackmail, Nissan demanded that the EU and Britain's future trading relationship with it should be resolved. European chairman of Nissan, Gianluca de Ficchy, said that "the continued uncertainty around the UK's future relationship with the EU is not helping companies like ours to plan for the future". Nissan's Sunderland plant opened in 1986. It is widely understood that the only reason Nissan invested in Britain in the past was its access to Europe, and the free money it received, since being enticed by Thatcher in the 1980s with handouts, while not being tariffed if producing outside. In other words, it might as well produce elsewhere. Nissan's switching of its production to Japan may have more to do with the recent entry into force of the EU-Japan free-trade agreement which will also slash tariffs for vehicle imports into the bloc over a seven-year phase-in period. 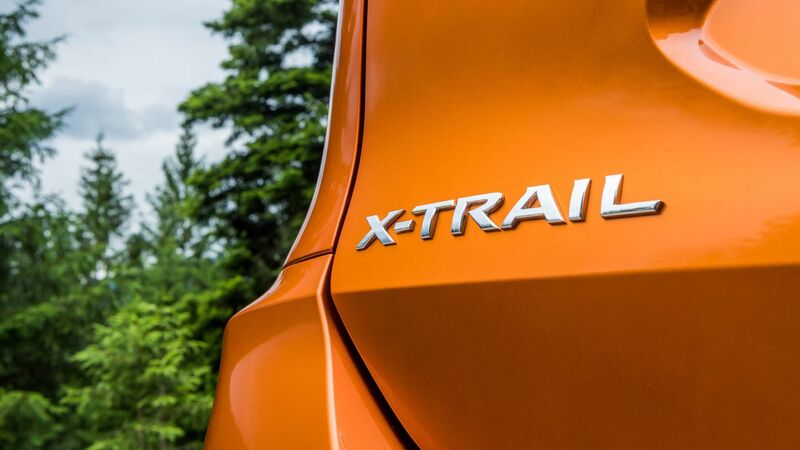 That makes it easier for Nissan to manufacture X-Trails in Kyushu, Japan, and ship them to the EU. By claiming that this move is because of Brexit or diesel-gate suits them to pursue their interests in both Britain and the EU. The government tried to justify its stand after Business Minister Richard Harrington told the BBC that Nissan would get the £61m support payment anyway. "It's to do with research and development", he said in Newcastle. "This was nothing to do with the X-Trail." Meanwhile, Greg Clerk expressed the current sycophantic position by saying, "I believe their advice should be listened to and acted upon." Another contradiction has arisen for the monopoly. In Britain, diesels that fail to meet emissions standards face a levy and the EU and Britain have announced bans on both new diesel and petrol vehicles in future. Many companies have overcome emissions problems on diesels and the market is said to be rising again. The results of sales of new diesel cars in Britain had tumbled by 30% in 2018, according to the Society of Motor Manufacturers and Traders. In a letter to workers, Nissan said that continued Brexit uncertainty is not helping firms to "plan for the future". Unite's acting national officer for the car industry, Steve Bush, said: "This is very disappointing news for Sunderland and the North East and reflects the serious challenges facing the entire UK auto sector." He added that the union remained "seriously concerned" that "the apprenticeships and additional jobs that come with future investment and which this community so desperately needs will be lost". 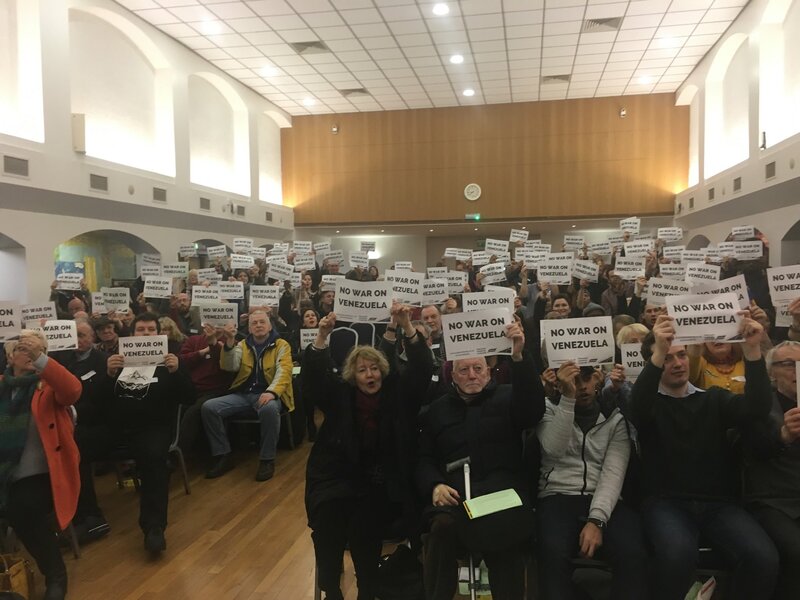 Baggage handlers and check-in staff employed by Azzurra Ground Handling at Luton Airport started voting for industrial action on Wednesday, January 30. The dispute was over the company's arbitrary decision to impose a pay freeze. The question has to be asked why a profitable enterprise should be able to do this, why should the company remove the claim by workers on the value they create? As if it is their God-given right as declared owners to do so. It is not their right; workers have their rights too. Azzurra provides ground-handling services to Wizz Air at Luton Airport. Wizz Air is a low-cost airline with around 42 routes from Luton. According to Unite the union, which represents the majority of workers at Azzurra, they submitted a pay claim on the workers' behalf at the beginning of 2018. Despite numerous attempts to get meaningful pay talks underway, the company has refused to engage properly with the workforce. Earlier in 2018, Luton baggage handlers called off a planned strike for the May bank holiday weekend. 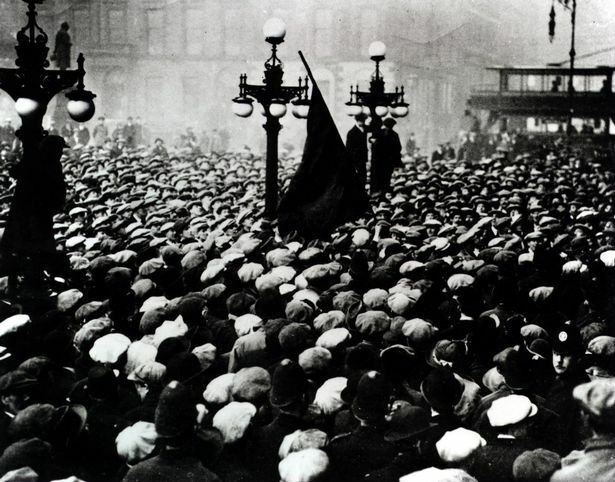 At the time, the union thought that "productive talks" had taken place, and the action was suspended. It appears that the company were playing games. When the seriousness of the company was called into question again, unions announced a planned strike to take place on July 20 and 22, 2018. A deal was reached to prevent strike action by ground staff. Baggage handlers, check-in staff, passenger service assistants and security staff employed by Menzies Aviation at the airport then voted to accept a pay offer worth 8.75%. The agreement would have meant a typical baggage handler's annual pay should have increased by around £1,670 by January 2019, according to the Unite union. 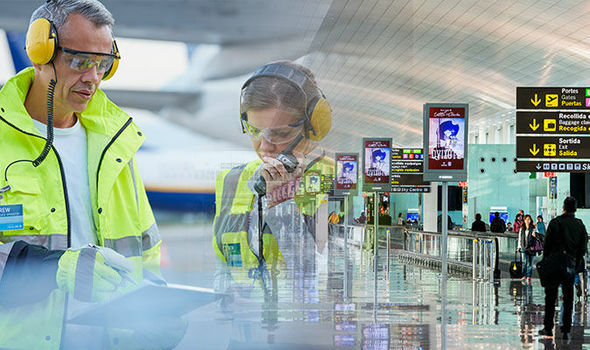 Unite regional officer Jeff Hodge said: "Luton Airport is one of the busiest airports in the UK and Azzurra should be recognising the contribution baggage handlers and check-in staff make by increasing pay so workers can keep up with the rising cost of living. "The union has been calling for meaningful talks since the beginning of 2018. Azzurra's failure leaves workers with no other choice but to begin a ballot for strike action. If a strike goes ahead it will lead to considerable disruption to flights out of Luton. We hope the company will now sit down with the workers' representatives and resolve this dispute." Separately, cleaners at Luton Airport employed by Sasse recently voted to end their strike over pay after the workers voted to back an improved pay offer from the company. Cleaners on the day shift will receive an increase of 5% and night shift workers will get a 6% increase backdated to October 2018 up to April 2019, followed by a 3% increase for the day shift and a 4% increase for the night shift from April 2019 to April 2020. What it means is that, currently, there are workers willing to step up their struggle across the board. 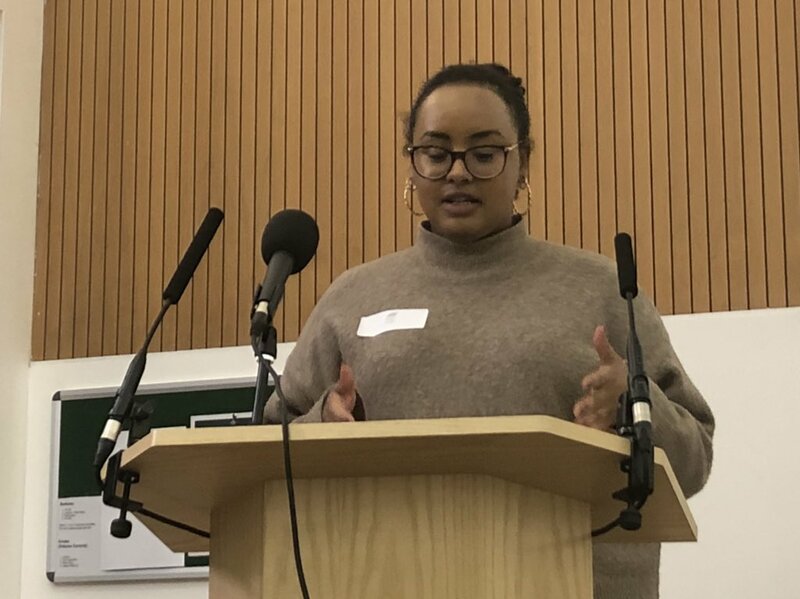 Not only does the strike action over pay inspire moves in the same direction at the same location, but it inspires action throughout the working class who are faced with similar problems. Solidarity therefore comes to these sections on the basis that "An injury to one is an injury to all". Section after section are asserting their demands in the face of productivity drives, staff cuts, rising prices and increasing bills. Workers are refusing to tighten their belts as the rich get richer and the poor get poorer. They are asking the question as to why they are the ones who always have to pay for the economic crisis through austerity and pay freezes imposed by government and monopolies alike. 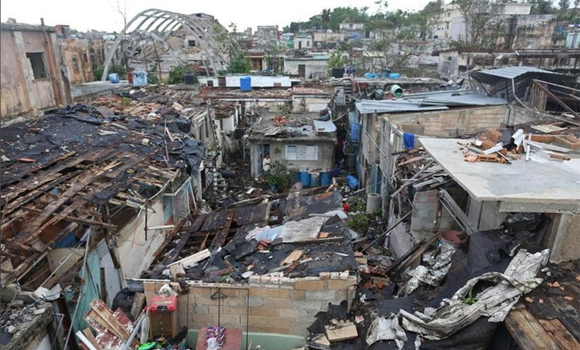 The British Cuba Solidarity Campaign has donated £2,000 to the relief appeal following the shock tornado which ripped through five municipalities on January 27. Six people were killed and 195 injured in the worst storm to hit the Cuban capital for 80 years. Damage to homes and infrastructure was considerable, with total and partial collapse of buildings, and winds tearing up and overturning trees, vehicles and electricity cables. Work is already underway to repair property including damaged schools, hospitals, utilities and public buildings, and re-establish services. If you would like to donate to relief efforts, CSC has launched an appeal to collect donations. We will make regular bulk transfers to Cuba to avoid international banking fees on individual's transactions and difficulties people may have with personal bank transfers due the US blockade. 100% of donations will be passed on to relief work being coordinated by government agencies and ministries in Cuba. If you prefer to donate directly to the appeal account set up by the Cuban government, you can do so via the Banco Financiero Internacional (BFI), account number 0300000005093523. Donations via this account may incur international transfer charges. 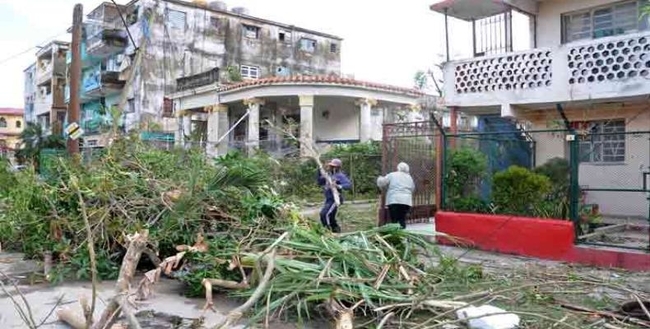 CSC reiterates its solidarity with the Cuban people in the mammoth task they have ahead to rebuild their communities. We call once again for the US government to end its inhumane blockade of the country so that the Cuban people can access the building materials and equipment they will need to reconstruct Havana following this tragedy. Local authorities, the military, mass organizations, neighbours, institutions and the general public have all been pulling together since Sunday to support recovery efforts. The same day he chaired two Council of Ministers meetings to evaluate the situation and adopt measures to advance recovery efforts. He noted that "Reinforcing attention to the population at times like these is vitalâ¦ it is imperative, he said, to explain to the people what is being done." Meanwhile, Ministers of Health, Construction, Communications, Water Resources, and Energy, among others, reported on damage and work underway to rebuild and re-establish services. Cuban Vice President Roberto Morales, speaking January 31, during a tour of an educational institution hit by the tornado stated that, "We have to move on to the next stage so that with builders and support brigades, we can fix everything as quickly as possible, and to the highest standard, so that when the teachers return to their schools they feel like it was all just a nightmare and now their workplaces, their homes, are better than before." Outpourings of love, support and solidarity from in and outside of Cuba have been flowing ever since the news of the disaster broke. Cubans have been mobilizing from the outset to aid recovery efforts and support fellow inhabitants. People have been working directly in affected neighbourhoods alongside official brigades clearing debris and rubble, while others have been donating material goods and opening their homes to friends and neighbours affected. The account number for donations in CUC is 0300000005093523, through Cuba's Banco Financiero Internacional, while national pesos can be deposited in account number 0598770003953216 at the Banco Metropolitano. We recognise the tremendous efforts of the Cuban people to move swiftly and professionally to deal with the disaster, led by President Miguel DÃ­az-Canel BermÃºdez, the Cuban government, provincial and municipal authorities and the various organisations involved in recovery and rebuilding. We would also like to offer our support and assistance to the relief efforts. 170, Wandsworth Road, London, SW8 2LA.